Camping does not provide all the comfort you have at your home. There is no need to wear fancy clothes or manicure your nails. While you don’t need to look amazing, it is essential you maintain a certain level of cleanliness for your health’s sake. You are not advised to bring your regular soaps and shampoo to a camp. The detergents most people use in their homes are non-biodegradable. This means that if they are disposed on the environment, there will be traces of their toxic chemicals 100 years later. Their impact on the environment is also devastating. Regular soaps contain triclosan, phosphate and antibacterial ingredients that are not eco-friendly. Triclosan is poisonous to aquatic life. Surfactants in regular detergents can accelerate the growth of algae which may destroy other plant and animal life by using all oxygen in the water. Instead, you should carry a biodegradable camp soap to ensure the environment is not ruined any further. Showering at least 200 yards from the rivers or lakes. Use little soap for your cleaning. Dig a hole and dump soapy water in it to allow the bacteria in the soil to break down the soap. Finally, you can dispose of the gray water over a large surface instead of digging a hole. The skin is the largest organ of a human being. Therefore, it is essential to take care of it. Did you know that it is easier for toxic substances to get into your body that it is to get out? Before buying soaps, you should look at the ingredients to ensure they are mild on your skin and the environment as well. Here are other benefits of biodegradable soaps. They are decomposed by bacteria; thus, they leave no trace of harmful chemicals. They pose lesser risks to aquatic life as compared to regular soaps. They are super concentrated. This means you use less soap per cleaning and end up saving some cash. They are produced with natural ingredients which cause little to no irritation your skin. The organic ingredients are good for your skin as they moisturize and nourish it. In addition, they don’t contain any carcinogens, so you can say goodbye to skin cancer. Environmentally safe. There are soaps with natural ingredients that are considered safe for wildlife and the environment at large. Ensure you buy camping soaps that are approved by the FDA to be biodegradable. Bar soaps require less packing as compared to liquid soap which is packed in plastics. Therefore, bar soaps are more environmentally safe as compared to liquid soaps. Natural. Look at all the ingredients to ensure there are no genetically modified substances used to manufacture the soap. Ascertain the soap is free of synthetic and non-biodegradable detergents. Finally, look out for pollutants such as triclosan and phosphorus. Mild fragrance. Most biodegradable camping soaps are subtly fragranced or with no aroma at all since they are manufactured from natural ingredients. Thus, they do not have artificial perfumes. Animal-friendly. An environmentally friendly soap for camping should be mild on animals. Travel-friendly. The soap should be easy to pack, and it should serve multiple purposes. For instance, wash clothes, dishes, your body, and your hair. It should also be usable in different types of water at different temperatures. Power to remove dirt. The soap should remove dirt and stains with ease. Suds formation. Go for a soap that lathers easily. This means you will use a small amount of detergent and conserve the environment. Durability. Generally, bar soaps are more durable compared to liquid soaps. You can store your bar soap in a dry spot to extend its lifespan. After considering the factors above, there are just a few environmentally friendly soaps that you can choose from. It is a multipurpose soap that can be used on anything from dishes to your hair, and personal use. Plus, it is concentrated. Sea to Summit recommends one cap per shower. This means the three-ounce bottle will last for some time. The soap has a neutral pH and does not contain phosphates. The container is sturdy with a tight lid and small nozzle. Thus, you won’t have to deal with spillage issues. 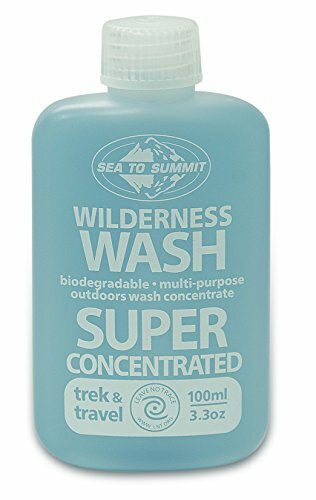 If you are looking for an environmentally safe shampoo for camping, Sea to Summit Wilderness Wash is the soap for you. It is available in three sizes. All the sizes meet the airport regulations, including those for the United States. Cleaning wipes are useful when camping. 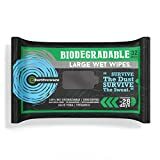 Surviveware Biodegradable Wet Wipes are among the best biodegradable wet wipes because they are big; approximately three times larger than normal wet wipes. One piece is about 8″ x 11″. It is about the size of an A4 paper. One piece is enough to scrub your whole body or all dishes from dinner, depending on the level of dirt. One package of 32 pieces will last for some time. In addition, the wipes do not contain alcohol which can dry your skin, and they are unscented. It has essential ingredients such as aloe vera and Vitamin E, which moisturizes your skin to keep it from cracking. The wet wipes are very friendly to the environment. It takes them approximately 28 days to decompose. Therefore, you won’t feel guilty about using them as they will eventually decompose into the soil. The price is reasonable, considering how long one packet will last. 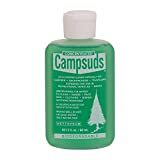 Campsuds was the first biodegradable soap to be manufactured in the USA in 1960. The multipurpose soap was created with campers in mind. Since then, Campsuds has always found its way into a camper’s backpack. The soap works well in all types of water, from hot, cold, hard, and salty lake waters. A few drops are enough to get your cleaning job done. The soap is gentle on the body and hair, and strong enough for clothes and dishes. If you are looking for an eco friendly body wash, Sierra Dawn Campsuds Outdoor Soap is a go for you. The bottle has a small nozzle. Therefore, worries for spillage in your backpack. The soap is dispensed in drops. Thus, it is easier to manage how much you will use to avoid forming too much lather that will require a lot of water to rinse. Campsuds is produced from natural essential oils, purified water, germaben, and vegetable-based cleaning agents. It is available in different sizes. When using the soap, remember to follow the leave no trace rules. When camping, the last thing you want is a very heavy bag. Therefore, you would want to replace heavy stuff with much lighter stuff. This includes soap. Coleman Soap Sheets are biodegradable, portable, and lightweight. A pack has fifty sheets that are eco-friendly. Coleman Soap Sheets are approved by TSA. Thus, you can comfortably pack it in your backpack as you travel by air. Unlike a bottle of soap, you don’t have to worry about spillage when using soap sheets. You need to add some water for more lather to form. It is advisable to remove the sheets from the pack with clean and dry hands. The soap sheets can be used to clean dishes, hands, clothes, and personal use. They also work with different types of water to produce lather. Sasquatch soap contains 100% natural ingredients which nourish, moisturize, and soothe your skin. It scented with natural essential oils. Therefore, you won’t have to worry about synthetic perfumes, toxic chemicals, artificial dyes, or preservatives. The soap is packed in a recyclable and reusable travel tin. It is an excellent choice for campers who want an eco friendly soap for camping. The soap is handmade in the United States of America. Seattle Sundries is an American company that is dedicated to producing biodegradable soaps from scratch. They use pure essential oils, colors, coconut oil, cocoa powder which gives it the brown color, and other organic ingredients to manufacture soap. 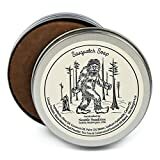 Sasquatch soap is made using the traditional cold-process method of making soap. To ensure the quality of the end product, the detergent is made in small batches. The soapmakers ensure all ingredients are precisely measured, mixed, and molded. The bars of soap are allowed to cool before they are sized. The soaps are cured for at least four weeks before they are packaged and sold. Though it is produced by a small company in Michigan, Joshua Tree Body Wash and Shampoo is one of the best biodegradable camp soap. It has a simple formula with the finest natural and organic ingredients which makes it eco-friendly. The first thing that makes you love the soap is how it feels on your skin. Though it feels like regular soap, the fact that it is biodegradable is an added advantage. The soap can be used for multiple purposes, from cleaning dishes to personal use and even washing the dog. When using it to shower, you can use it directly. However, when using the soap to clean the dog, utensils, or clothes, dilute it with water. It is available in an 8 oz/236 ml bottle which is much portable. Though it lathers, it is not as sudsy as regular soap. The soap has a fantastic scent. Joshua Tree Body Wash and Shampoo comes in lavender, citrus, and mint combined with tea tree. The variety ensures there is a choice for everyone. In addition, it contains jojoba oil for conditioning the hair and skin. The soap is 100% natural, and it repels pesky insects without the use of toxic chemicals like DEET. The super concentrated formula contains essential oils such as sandalwood and citronella which wads of bugs and bad odors. The environmentally friendly shower gel does not contain toxic substances such as phosphate and paraben. The bottle is sturdy and leak-proof with a small nozzle and tight lid. Sea to Summit packs smaller sizes of 40 ml (1.4 oz) and 89 ml (3 oz) which complies with the airline regulations on the transportation of liquids including TSA in the United States. Though it is gentle of fabrics, it is tough on stains. 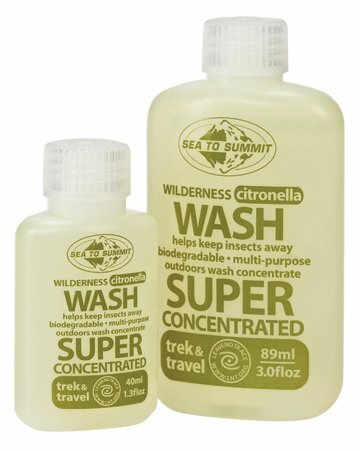 Citronella Wilderness Wash is suitable for your personal use, dishes, and clothes. The soap can be used with different types of water hot, cold, salty, or hard. However, the users should strictly follow the leave no trace guidelines. The soap is made with natural ingredients including citronella essential oils. Most people use it as a mosquito repellent. The soap is manufactured using natural ingredients. Therefore, just like medicine, excess usage of the soap is not recommended. The natural ingredients make the soap usable at all times. When you buy soap, you are awarded a carry case for traveling. Therefore, you won’t have to worry about spillage in your backpack. Skeeter Beater Soap contains environmental friendly ingredients such as coconut oil, olive oil, and shea butter which make it biodegradable. It is essential to note that the detergent does not contain toxic chemicals such as DEET to repel the insects. Nobody likes applying poisonous chemicals on their skin in the name of repelling insects. Trascentuals only use citronella which is derived from plants to repel insects. All soaps by Trascentuals are handmade in the U.S. No machine is used to make the bars or cut hem or pack them. Therefore, you can be guaranteed of high quality. The detergent is safe for personal use. Since it is made with natural ingredients, it is unlikely to irritate your skin. When choosing a biodegradable soap for use when camping, it is essential to consider various things. While some soaps are suitable for personal usage, others are good for washing dishes and clothes. You should also ensure a soap is animal-friendly before using it to clean your dog. When you are going to areas infested with bugs, consider buying soaps that have ingredients like citronella which is a natural bug repellent. As you use the eco-friendly detergents, always remember the leave no trace guidelines. You won’t be conserving the environment by using biodegradable soaps directly in water sources. Also, familiarize yourself with cleaning methods that require minimum usage of soap and water, like the biodegradable wet wipes.